Born in 1968 and raised in Germany. Sabine began riding at the age of 9, and competed successfully as a junior and young rider in Germany starting at the age of 13. Sabine has been riding as a professional since the age of 18. Sabine received her riding / training background from some of the best coaches trained in the "Classical" German style, including Jürgen Koschel, Thomas Schmitz, Harry Boldt and currently Christine Traurig. ~ 1988-1990 Sabine worked in California as a dressage trainer / rider of European imported dressage horses. ~ Sabine's education includes a Master's Degree in Physical Education and Therapy from the German Sport University Cologne (Deutsche Sporthochschule Köln), and in 1995 a certification from the Deutsche Reiterliche Vereinigung, or German F.N. as a riding instructor. 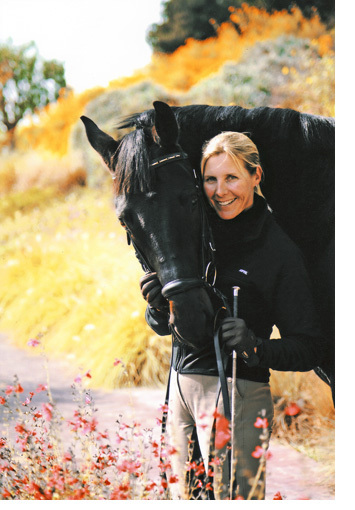 ~ Sabine has extensive experience in training young horses up through the levels in dressage and in 1996 moved from Germany to the United States where she started her own training business. ~ Since 1997 Sabine has been competing in California and has numerous placings and winnings in all different levels from Training to Grand Prix. • 2002-2004 Placings in Grand Prix with "Persson"
• Currently promoting and showing a 9 year old Holsteiner breeding Stallion "Chevalier" owned by Patricia Mahaffey and a 8 year old Lusitano Stallion "Zelozo" owned by MaBelle Bray.